The Zig Fine and Bullet Marker features both a fine tip for writing and a bullet tip for colorful illustrating. Use this pen to write in hundreds of fun lettering styles, especially dot lettering. 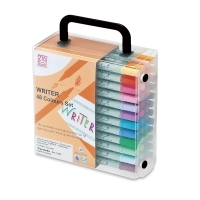 It's perfect for writing in photo albums and scrapbooks. Zig acid-free, pigment ink is lightfast, fadeproof, odorless, xylene free, and non-bleeding. Each marker features a 0.5 mm fine tip and a 1.2 mm bullet tip. Note — Please see Item Specs tab for full color listings of each set.